Place the courgette, red onion and cherry tomatoes in a bowl. Slice one of the lemons and juice the other one, then add to the bowl along with the olive oil and oregano. Season with salt and pepper and mix well. 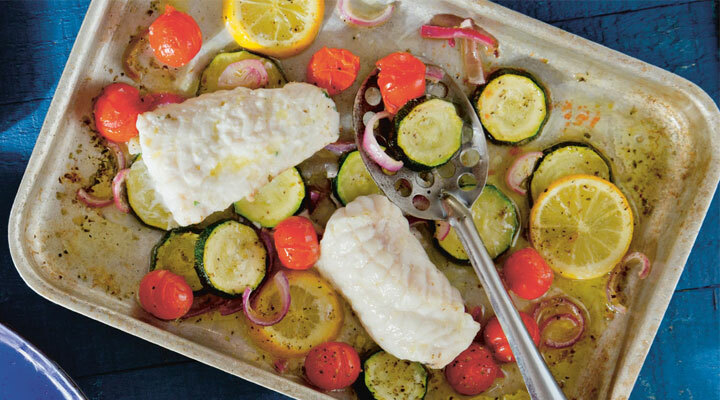 Place the ingredients on a large baking tray, top with the monkfish and bake for 20 minutes. Serve with penne pasta and scatter with halved black olives if you like.